For more than 10 years on the Bulgarian market, our company became a leading provider of car rental service. Over 80,000 customers have chosen our services over the years, and we managed to reach the charts №1 of independent international rating sites with over 1,500 Reviews and over 90% positive feedback. This autumn we launched new service targeted both to business and private customers. The service is cargo van rental from Top Rent A Car. 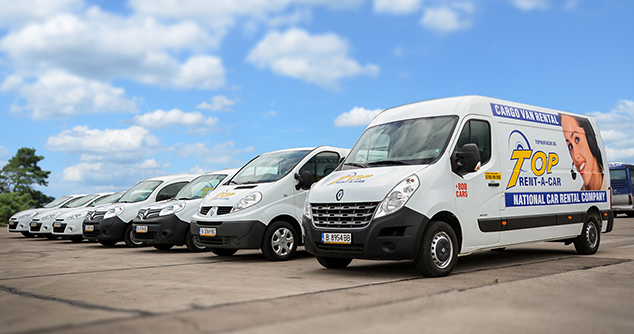 Our cargo vans fleet consists of new vehicles from 5 classes covering wide range of models – from economy Renault Clio III Van (500 kg payload) to Iveco Daily Van (2300 kg payload). Light commercial vehicle rental (cargo van rental) is very suitable for businesses like forwarding companies, logistics companies, sales representatives, retail business owners. When renting a truck from us, you can finally forget about the maintenance costs, unexpected road breakdowns and high fuel bills, as you focus on your business. All light commercial vehicles in our fleet can be driven with driving license category B. You can rent a van for removal, moving furniture, luggage, equipment etc. Save a lot of money from using a company specialized in expensive transportation services! Our cargo van rental service is now available in Sofia. We also offer delivery to Plovdiv, Varna, Burgas and Veliko Tarnovo at additional fee. More about the service and other useful information read our articles on Light commercial vehicles (LCV). See the promotional rates and book cargo van now! Next:Take advantage of our July offers!